The Supreme Rada of Ukraine has adopted a decision to allocate 400 million hryvnia (about US$17.06 million) to pay wage arrears to miners. The parliamentarians decided to take the above amount from the state budget 2015 to restructure the coal mining sector. Ukraine's Minister of Energy and Coal Industry Vladimir Demchishin said at the Supreme Rada additional funds will help to pay miners the arears of wages for a month. 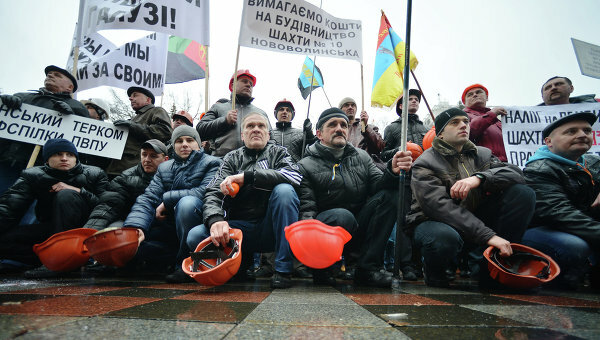 The minister said the areas of wages for Nov-Dec 2014 amounted to some 650 million hryvnia (US$27.72 million) of which 200 million hryvnia were repaid, while the remaining 450 million hryvnia “must be paid from the current proceeds from the mines.” In addition, he said, Ukrainian mines were actually idling at the beginning of the year due to sales problems. “These 400 million hryvnia will greatly help us with the current settlements,” Demchishin said. According to him, the ministry is seeking ways to support the mining sector also through foreign investments and privatization of the mines.